White Grubs are the larvae of various scarab beetles, family Scarabaeidae, including May, June and Japanese Beetles. They are whitish with brown heads and three pairs of legs, and are often found curled into a C shape under the soil surface. Size varies from around a half inch to two inches in length according to species. If skunks, raccoons, moles and other small animals are digging in your lawn, this may indicate the presence of white grubs. 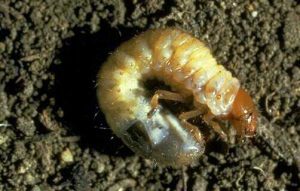 These larvae feed on roots, particularly in lawns where the turf may become brown in patches and can be rolled back like a carpet. 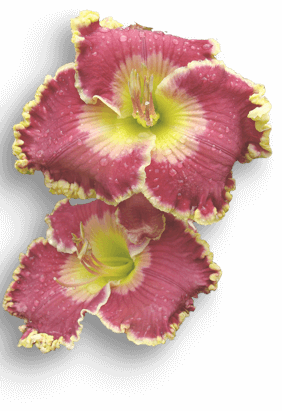 They have been reported, however, to feed on daylily roots on occasion. This is probably most likely where a new daylily planting bed has been recently dug out of a grassed area. On a small seedling the roots may be severed just below the soil surface and the plant found lying on the ground. On digging into the soil where the seedling was growing, you may find one of these grubs and can remove and destroy it. Digging new beds in the fall and leaving unplanted until spring will expose some grubs to birds and other predators. Burying cut potatoes in the soil in affected areas is said to attract the grubs, which can then be removed every few days. Where more extensive control is required, parasitic nematodes and milky spore disease may be applied to affected areas.